To best understand Cavalry Court, a hotel deep in the heart of Texas, it helps to acquaint oneself with the city of College Station, home of Texas A&M University. The property is on campus, and the hotel name refers to the school’s Parsons Mounted Cavalry, with its 55 horses and mules as well as its training program for the student Corps of Cadets. The students, by the way, are known as Aggies, all 68,000-plus of them. Welcome to Aggieland, a place of proudly maintained social traditions but little in the way of sophisticated hospitality venues. Who better to remedy that lack than Lauren Rottet, a Texan who is also an Interior Design Hall of Fame member? “I was born in Waco and later moved to Houston,” Rottet begins. “When I would go back to Waco to visit my grandmother, I would stop in College Station. And there was never anything there but the school.” She had completed a handful of renovations in Texas and California for Valencia Group Hotels, which called her back after signing on with Midway Corporation to develop the ground-up Cavalry Court under the direction of Valencia vice president of branding and design Brandi Montgomery. “We were in from the first minute,” Rottet Studio associate principal Chris Evans says. 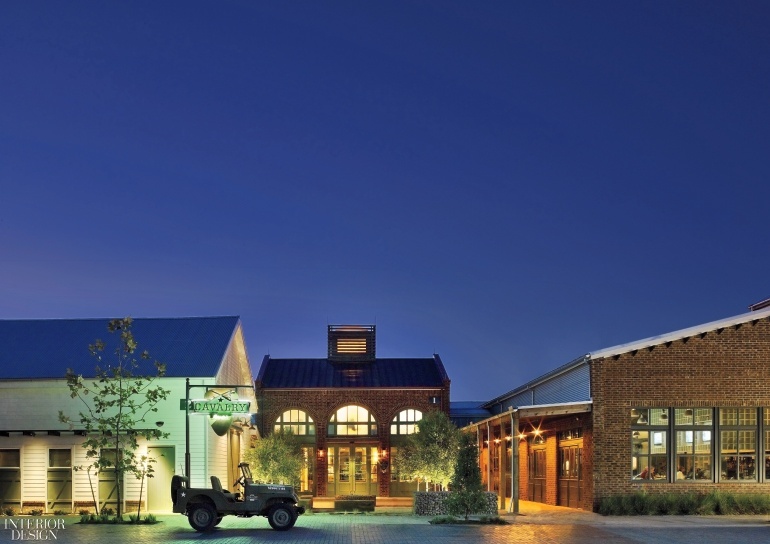 Part of the attraction was the fact that the firm’s talents would be stretched beyond its accustomed architecture and interiors to encompass site planning and landscaping, working closely with a consultant on the alfresco amenities. Sun descends through a light well’s reclaimed pine slats, into reception. Photography by Eric Laignel. Decidedly tied to place, not only the university but also the agricultural surroundings, the resulting aesthetic skews rustic with honest, straightforward materials and forms. Yet, typical Rottet, it’s still polished. And we couldn’t call it traditional. Her scheme is devised to appeal to a wide-reaching demographic, from visiting alumni to business travelers and locals. The 142 guest rooms occupy five of the buildings, which are designed as two distinct types. Emphasizing outward-facing sociability with rooms opening directly from an open-air front walkway, the four single-story ones are called Barracks. Their three-story counterpart, Officers’ Quarters, has rooms lining a central corridor bookended by stair towers. The fitness center is on the ground level. 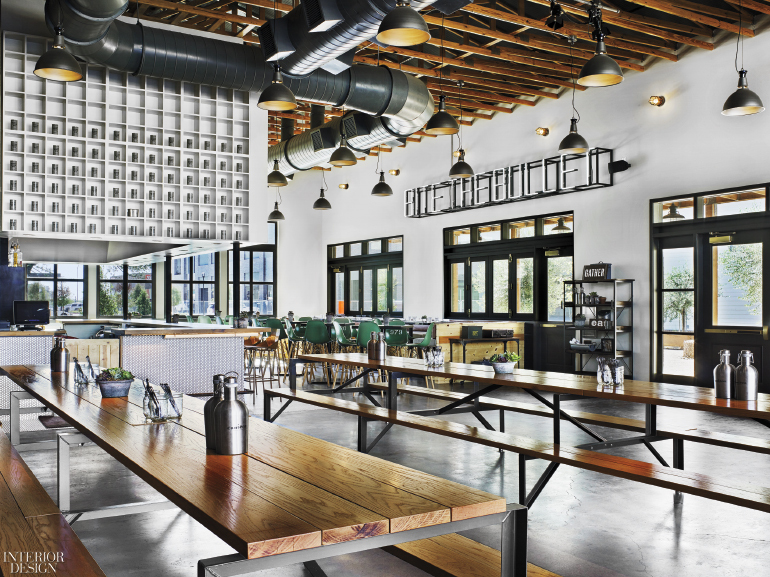 The restaurant’s custom tables in steel and oak integrate benches. Photography by Eric Laignel. Nomenclature aside, there is no difference in rank. “All the rooms have the same DNA,” Evans says. Outfitted in somewhat campaign-style furnishings, the 360 square feet feels particularly generous, thanks to plentiful windows. 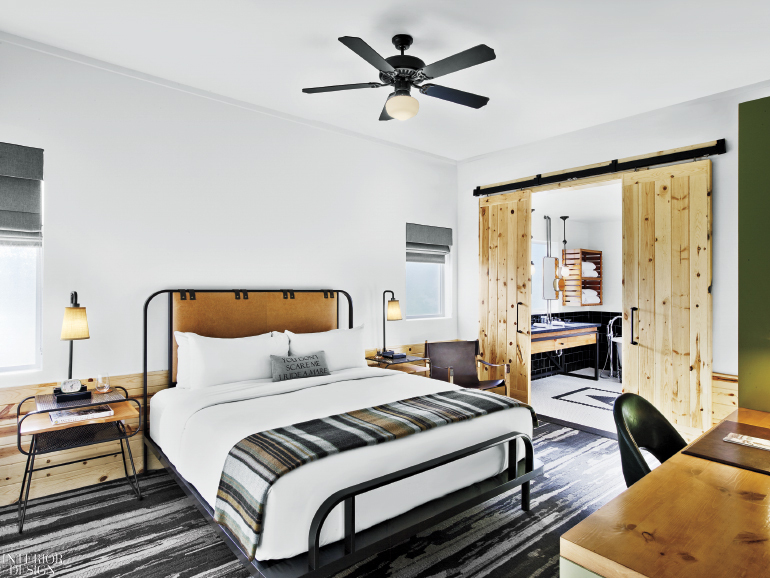 Barn doors slide back to join the bedrooms with the bathrooms. Military terms continue in the public spaces. The Guard House, aka reception, has a “watch tower” in the form of a slatted structure topped by a skylight. Inside, ammunition crates stack up to form the check-in desk. Equally cheeky is the reception lounge’s cocktail table: Under the glass top, Evans hand-glued green plastic toy soldiers, 900 of them. He collaborated with his woodworker father on both the desk and the table, among many sui generis elements on the premises. Beds, also custom, have leather-covered headboards. Photography by Eric Laignel. In the Mess Hall, open-mindedness takes the shape of boots and farm equipment hanging from pegboard that, set into the beadboard, has been sten- ciled with black silhouettes of a cannon, crossed swords, a guitar, and more. On the opposite wall, a neon sign proclaims “Bite the Bullet.” Above the bar, army-surplus water cans fill a grid of cubbyholes. Then there’s a concrete-topped Ping-Pong table for entertainment. 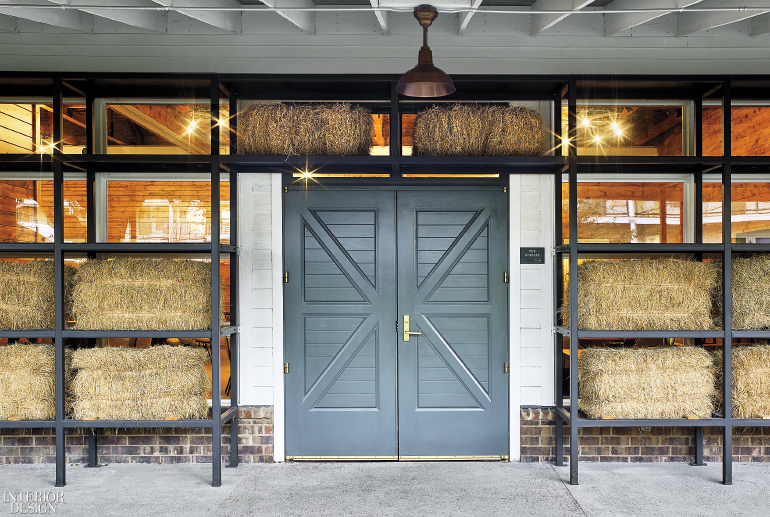 On the other side of the Guard House from the Mess Hall, the Stables seems, at first glance, to be the real thing—with steel racks holding hay bales, aromatic and tactile. (Replaced quarterly.) No equestrian exercises take place here, however. What does get a workout is human minds. This is the conference center, boasting a large conference room and two smaller meeting rooms inside and a pre-function area outdoors for spillover. Courtyards, inspired by military parade grounds, boast shade trees that have been growing there for centuries and—made with wood from those trees sacrificed for the project—a troop of massive benches. The main courtyard offers a swimming pool along with cabanas and a café pavilion. Their angular forms in canvas, stretched over tubular steel, derive from bivouac shelters. Aggies, at ease. The conference center’s pre-function area is outdoors. Photography by Eric Laignel. Project Team: Jeff Horning; Kaitlin Borgen; Maksim Koloskov; Erin Dorey; Joshua Hollie; Jonathan Lampson: Rottet Studio. Kirksey Architecture: Architect of Record. Studio Lumina: Lighting Consultant. Ten Eyck Landscape Architects: Landscaping Consultant. Raymond L. Goodson Jr.: Structural Engineer. Thompson Ehle Company: MEP. 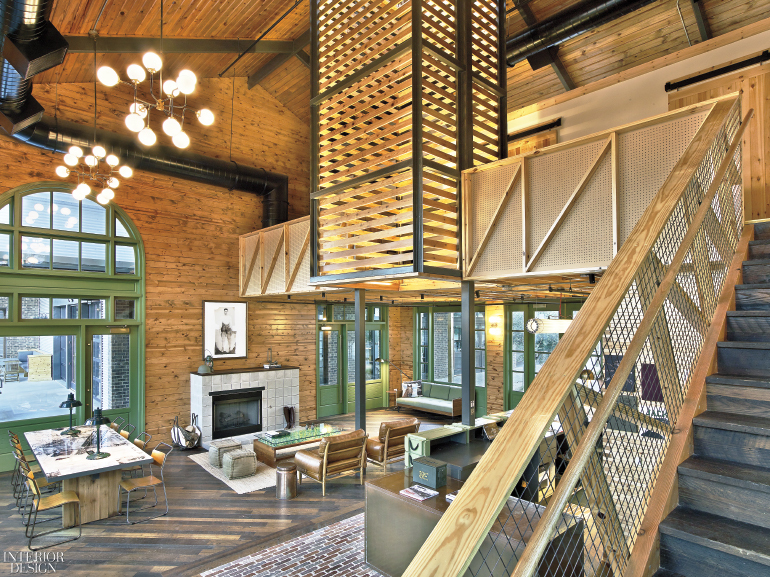 Key Stone Millwork: Woodwork. Evans Custom: Furniture Workshop. ION Art: Signage Workshop. Keys & Walsh Construction: General Contractor.